I hate to rain on John McCain's parade right after he trounced Barack Obama at Rick Warren's Saddleback Church forum, for which I heartily applaud him, but McCain's trial balloon consideration of a pro-choice running mate demands a response. The prospect of an Obama presidency is so horrifying that many conservatives have temporarily put aside their misgivings about McCain to focus on defeating Obama. 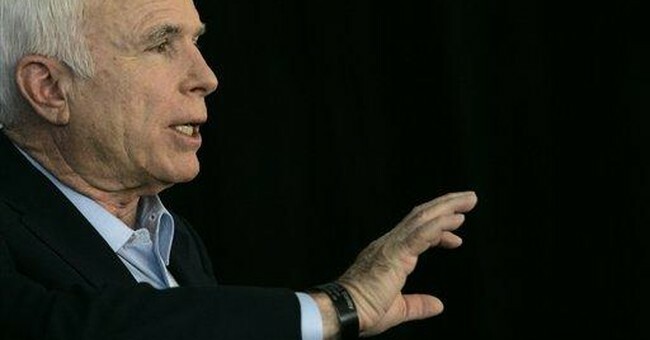 They hold their noses on McCain's immigration record, his campaign finance reform zealotry and his newfound acquiescence to the propaganda narrative of environmental extremists. But they are profoundly appreciative of his tougher stance against tax increases and mindful of his undeniable superiority over Obama on foreign policy and national defense. Recent world events, including Russia's naked aggression against Georgia, magnify this already-glaring contrast. But while national defense necessarily occupies the front burner, McCain would make a fatal mistake to assume that social issues, especially abortion, are ever off an equally blazing front burner for an inestimable number of social conservatives, the Republicans' most reliable voting bloc over the past three decades. Last Wednesday, McCain "floated the prospect" of picking a pro-choice running mate and said that former Pennsylvania Gov. Tom Ridge would be an acceptable -- and possible -- selection. He told The Weekly Standard: "I think that the pro-life position is one of the important aspects or fundamentals of the Republican Party. And I also feel that -- and I'm not trying to equivocate here -- that Americans want us to work together." McCain must quit echoing the Democratic talking point that places form over substance and the illusion of bipartisanship above principle. Who says Americans "want us to work together" if that means abandoning legal protection for the innocent unborn or other inviolable principles? McCain said: "You know, Tom Ridge is one of the great leaders, and he happens to be pro-choice. And I don't think that that would necessarily rule Tom Ridge out." With all due respect, Sen. McCain, you may not rule Tom Ridge out, but if you choose him, you're virtually guaranteed of ruling yourself out. You misunderstand this at your electoral peril. Ridge, on "Fox News Sunday," also revealed his misapprehension of the importance of the life issue to a large percentage of Republican voters when he opined that his pro-choice stance wouldn't make him a liability among conservatives. "The last time I checked, the vice president is not an independent voice," said Ridge. That woefully misses the point. Not only is the vice president the president's immediate successor if the president dies or becomes incapacitated but also McCain's selection of a pro-abortionist candidate would send a message grossly undermining the Republican Party's uncompromising commitment to the lives of the unborn. But McCain apparently doesn't fully understand that. He said, "I think it's a fundamental tenet of our party to be pro-life, but that does not mean we exclude people from our party that are pro-choice." No pun intended, but McCain is presenting a false choice here. Excluding pro-abortionists from vice presidential consideration is not the same as excluding pro-choice people from the party. We're not talking rank and file party membership, but the selection of the candidate for the second-highest office in the land, whose importance is that much greater considering McCain's age. We don't need exit polling data -- only the powers of observation, experience and common sense -- to know that many pro-lifers are either single-issue voters or consider abortion to be by far the most important issue. You can be sure that they won't vote for McCain if he picks a pro-abortionist running mate. They will not have that blood on their hands; and you can bank on that. Postmodernist conventional wisdom notwithstanding, it is not an extremist position to be uncompromisingly opposed to killing babies in the womb. Being a matter of good versus evil, it is a morally imperative position. But if principle alone doesn't float the McCain boat on this issue, which I don't want to believe, the McCain camp also ought to consider other political ramifications of selecting a pro-abortionist. On no issue besides national security is Barack Obama more vulnerable than abortion. He not only has been without peer in his cultlike deification of abortion -- to the point of legislatively enabling infanticide -- but also is flagrantly and demonstrably lying about his record on these issues. And Obama doesn't even have the maturity of conviction or integrity to express an unequivocal position on when life begins, that question being above his "paygrade." McCain has a golden opportunity to expose both Obama's dark-heartedness and his lack of integrity by zeroing in on his abortion and infanticide record. But if McCain picks a pro-abortionist, he will forfeit his moral authority and political advantage on the issue and might very well be conceding the election to Obama.